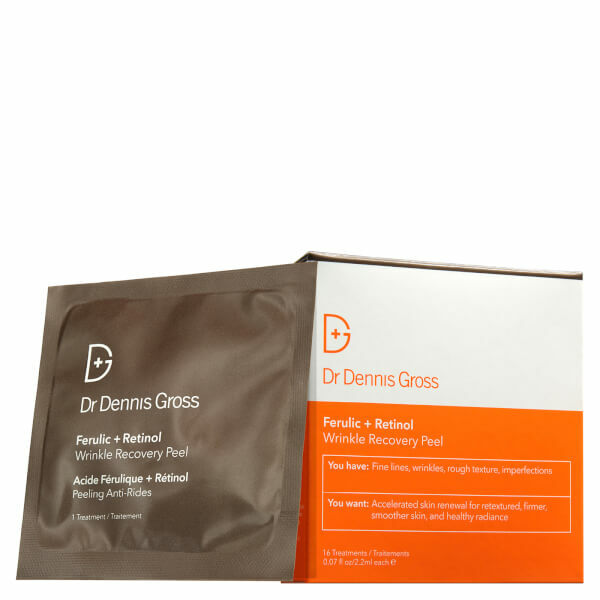 Dr Dennis Gross present the Ferulic and Retinol Wrinkle Recovery Peel; an anti-ageing, multi-beneficial formula that works to boost collagen production, promote cell renewal and support the skin's natural repair process. 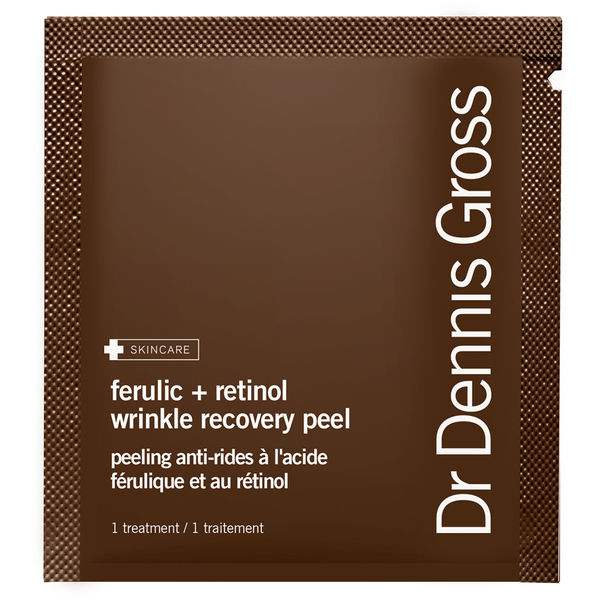 Fortified with a clinical dose of Retinol and Ferulic Acid, a plant-based antioxidant, the innovative, night-time treatment minimises the appearance of wrinkles and combats uneven skin tone, whilst gently exfoliating the skin's surface to improve texture for a smoother, more refined complexion come morning. Skin is firm, even and radiant. Individually wrapped for convenience. Thoroughly massage treatment pad onto clean, dry skin. 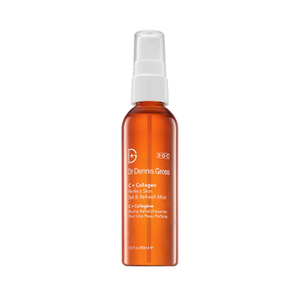 If slight sensitivity occurs, reduce frequency of use until skin adjusts.For optimal results, use 2-3 times a week in the evening. Use sunscreen during the day. Water/Aqua/Eau, Hamamelis Virginiana (Witch Hazel) Water, SD Alcohol 40-B, Butylene Glycol, Hydroxyethyl Urea, PEG-8 Dimethicone, Ethoxydiglycol, Retinol, Ferulic Acid, Centella Asiatica Extract, Bisabolol, Soy Isoflavones, Rehmannia Glutinosa Root Extract, Sodium Hyaluronate, Aloe Barbadensis Leaf Juice, Phospholipids, Sphingolipids, Squalane, Anthemis Nobilis Flower Extract, Camellia Sinensis Leaf Extract, Cucumis Sativus (Cucumber) Fruit Extract, Sodium PCA, Lactic Acid, Mandelic Acid, Linoleic Acid, Linolenic Acid, Glycerin, Caprylic/Capric Triglyceride, Tetrasodium EDTA, Sodium Hydroxide, Citrus Aurantium Bergamia (Bergamot) Fruit Extract, Citrus Limon (Lemon) Peel Extract, Lavandula Angustifolia (Lavender) Flower/Leaf/Stem Extract, PEG-40 Hydrogenated Castor Oil, BHA, Trideceth-9, Polysorbate 20, Potassium Sorbate, Benzoic Acid, BHT, Sodium Benzoate, Phenoxyethanol.